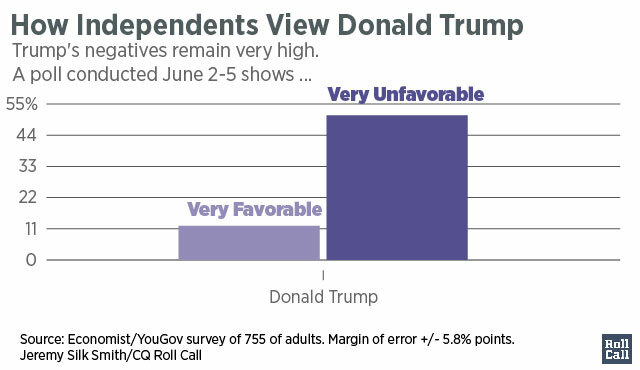 Majorities of independent voters surveyed have unfavorable views of both candidates as the general election gets underway. Trump’s unfavorable scores surpass the 60-percent mark — but Clinton is not far behind, according to a recent Economist/YouGov poll . St. Anselm College political science professor Chris Galdieri said self-described independents in “swingy” states could make a big difference in deciding who will be the 45th president. That’s because some voters “can’t pull the lever” for either candidate and are searching for a viable alternative. The poll provides further evidence of the sizable gap between Trump and voters who do not pledge allegiance to either major political party. Fifty-one percent of those independents surveyed reported “very unfavorable” opinions of the real estate mogul, and just 31 percent among the group said they would vote for the GOP nominee. [ Obama Comes Back at Trump Over &apos;Radical Islamic Terrorism&apos; ] A deeper dive into the poll, conducted June 2-5, reveals independents have deep doubts about Trump’s overall qualifications to be president. They also question his readiness to be commander in chief and find him to be dishonest. “He needs to start talking about economics, poor job [creation] performance, low labor participation, wage growth [being] stagnant,” Flake said. “If he starts talking about that, he can pick up independents and blue-collar former Reagan Democrats. [ Trump and the Re-Emergence of Unreasoning Fear ] GOP political strategist John Feehery warns that Trump could be in trouble unless he “recovers from what has been a rough period.” A key to attracting independents and even skeptical Republicans will be running a GOP convention in Cleveland next month that keeps Trump’s signature bombastic – some say, offensive – rhetoric at a minimum, Feehery said. Despite his low poll numbers with independent voters, Trump and his team might take solace in what the Economist/YouGov poll suggests will be his general election foe’s own uphill battle with the same group. Clinton secures “very favorable” or “somewhat favorable” scores from 39 percent of independents surveyed. Trump comes close, with 33 percent. Clinton’s collective “somewhat unfavorable” or “very unfavorable” score is 57 percent, only five percentage points better than Trump’s 62 percent rating. Clinton’s decades as a public figure and experience as first lady, senator and secretary of state are a double-edged sword with independent voters. A majority (54 percent) say she is qualified to be president, compared with only 22 percent who say the same for the likely GOP nominee. And nearly twice as many (45 percent to 24 percent) replied to the Economist/YouGov survey that she is ready to be commander in chief compared to Trump. But independent voters have deep reservations about how honest Clinton is, something that has plagued her and her husband almost from the moment they stepped on the national stage almost 25 years ago. Sixty one percent labeled her “not honest and trustworthy.” That’s not much better than Trump, who was branded the same by 66 percent of independents surveyed. Still, on the issue of qualifications, Clinton holds a sizable advantage over the bombastic businessman as she begins in earnest to undercut his readiness to lead the country and its military.